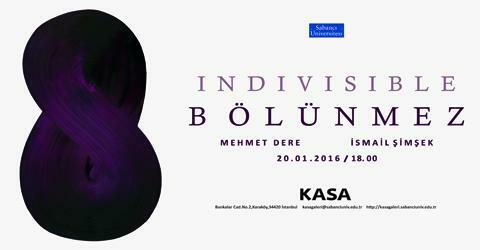 Sabancı University KASA Gallery is hosting the exhibition entitled “Indivisible” between January 20 and February 28, 2016. “Indivisible”, bringing the recent art works of the artists Mehmet Dere and İsmail Şimşek together, emerges as a result of the common reflex of the artists through their conceptual and internal sensitivities in process. Despite the difference in production methods and materials of the artists, the dialogue of visual elements in the construction of “form” creates integrity in the context of exhibition. “Indivisible” focuses on visual knowledge fictionalized from a poetic and profound point and its inseparable/indivisible integrity principle and relationship, through the abstraction prominent in the art works of the artists. Mehmet Dere graduated from Dokuz Eylül University, Faculty of Fine Arts, Department of Painting (2004). Mehmet Dere who is the founder of 49A, a contemporary art space in İzmir, and a member of the K2 Contemporary Art Center, received the special prize in the 27th Akbank Contemporary Artists Exhibition. As well his solo exhibition in Rampa Gallery (2011) he also participated various group exhibitions; 'When Ideas Become Crime' in Depo, (İstanbul / 2010), 'Quiet-Storm, Port Izmir 2nd International Contemporary Art Triennial (İzmir / 2010), ‘I am Here, The Time is Now’ (Rotterdam / 2008), and '10th Istanbul Biennial Special Projects' (Santralİstanbul / 2007). İsmail Şimşek graduated from Dokuz Eylül University, Faculty of Fine Arts Sculpture Department with honors and he is doing master degree on Art and Design at the same university. The artist uses the two realities (internal and external) he feels, as a psychological phenomenon. Şimşek’s sculptural works focus on the human existence, which directs the human being both to the resource and beyond, and its space and time experience.